Historian Patrick R. Foster and Motorbooks International bring AMC fans a terrific new book that delves deep inside of American Motors. In an unusual twist, the author starts the story in 1986--the beginning of the end of the manufacturer. You might be tempted to think that the corporate story has been completely covered and you'd be wrong. This history is fresh; it unfolds with new and delicious details that make every page of this 208-page book a a meaty read with plenty of sizzle and flavour. Nothing is left out, either. Jeep, AM General and the Renault years are well covered. Told in Foster's inimitable style, the sparkling saga simply pops with hundreds of rare and unusual photos, many in colour. Most fascinating are the sketches, models and mockups under consideration in the styling studios. 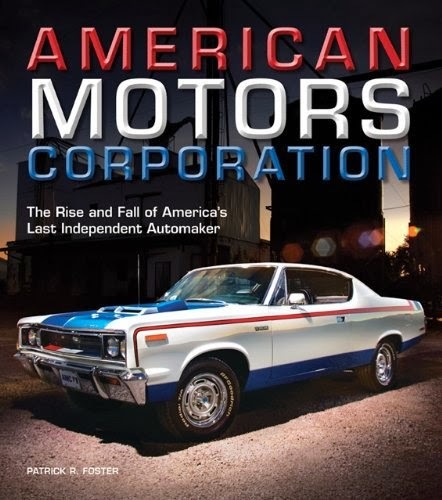 You don't have to be an AMC fan to enjoy this book--it reflects the North American auto industry. However, if you have ever waxed nostalgic for a Nash, hungered for a Hudson, loved a Rambler or pined for a Pacer--you will require this definitive book on the greatest of the independent auto manufacturers.